Enchanting accepted into the MMB, and leaves for her new home. After being in training for just 60 days, we threw Ella into the deep end of the pool and took her to be inspected at Hilton Farm. 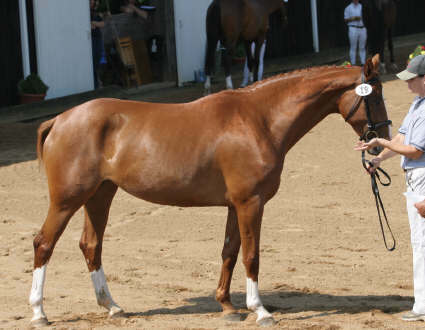 She rewarded our confidence by scoring a 6.67 to be accepted into the Main Mare Book of the American Hanoverian Society. The inspector noted her height of 15.2, but commented that she was quite harmonious in her conformation. Ella will leave next week to go to her new home in North Carolina. Owner Helen Gillick has big plans for this little girl, including breeding her in the spring of ’10 to Fielding. Excellent idea Helen! A cross I would have chosen myself for her. We wish them both the very best.